I’ve always been interested in the business world but not what I actually wanted to do in it – if only I would have known the value of an apprenticeship when I left school! I remember being an attracted to an apprenticeship in Business Administration whilst looking through an educational learning guide for School Leavers. But because I was surrounded by the view of University being the only way forward into a successful career, I chose to do a Business BTEC at college so that this option was there for me. Don’t get me wrong, I studied some great topics and did well, but I didn’t enjoy how I learned. I’ve always been a hands-on learner, and this is why I decided to do an apprenticeship in Business Administration after completing my BTEC. An apprenticeship has made a great change to my attitude in studying a qualification. I find it so much easier and motivating to learn by being shown physically how to do something and then trying it there and then, rather than being cooped up in a classroom and being lectured for the majority of the week. I love the independence and confidence it gives you. 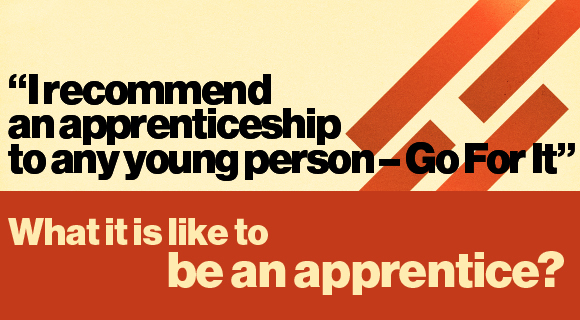 There are loads of benefits in choosing the apprenticeship route. It gives you the vital attitude to working life, gets you ready for what a career is really like – getting up early in the morning, staying focused for five days a week, meeting great new people of different ages and interesting stories of how they have got to where they are in their career and the skills you learn are countless – I really do learn something new every day! It’s also nice to have that financial independence – I used to be a bit of a hermit at college because I didn’t have the money to do everything I wanted to do, like for the big nights out and save up for holidays etc. But also, an apprenticeship has given me a great ability in managing my own finance which is always improving – my budgeting gets better every month, so I can save up for a holiday without being skint and still be a party animal now and again! My confidence has also improved a great deal since my apprenticeship. I’ve gained more belief in myself that by continuing to put in 110% effort in my working life I could get the higher powered jobs if I wanted to – without a degree. I may sound like I’m just trying to put people off going to Uni – that’s not my message at all. My message is that it’s not about what you learn or where you learn, it’s about how much effort you put in. And you don’t have the pressure of having to have straight A’s – another message I would like to give to young people is that it is not where you start, its where you finish. I honestly think more apprenticeships in all sorts of fields should continue to be developed. What about young people that want to become a Scientist? Would an apprenticeship in Medicines where the learner goes to a laboratory for four days of the week and trains by carrying out experiments assisting a Professor and then studies the text books one day a week be less valuable than a degree? Getting a job seems to be on the verge of impossible these days, and I know how it feels. I was chuffed when UKCES took me on as an apprentice. It’s definitely worth it guys, so go for it! A perfect example of how having the right attitude can make a difference to the career path of an individual - well done Charlotte. Perhaps the best way to address some of the issues is to have education and apprenticeship running alongside one another and providing a 'reasonable' rate to encourage participation.